Sunni militants today captured two border crossings, one along the frontier with Jordan and the other with Syria, security and military officials said. The capture of the two crossings follows the fall of four towns of Qaim, Rawah, Anah and Rutba. 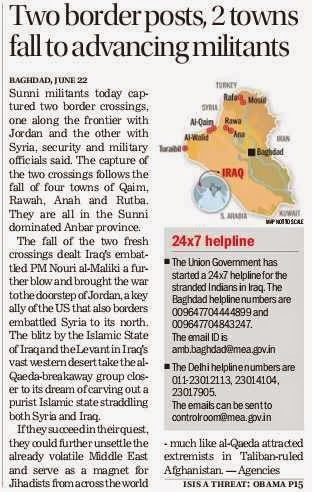 They are all in the Sunni dominated Anbar province. The fall of the two fresh crossings dealt Iraq's embattled PM Nouri al-Maliki a further blow and brought the war to the doorstep of Jordan, a key ally of the US that also borders embattled Syria to its north. 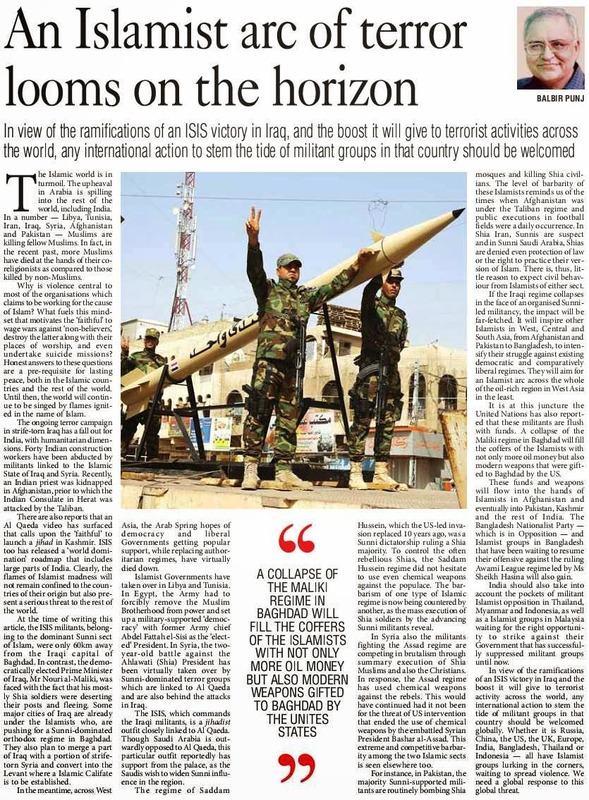 The blitz by the Islamic State of Iraq and the Levant in Iraq's vast western desert take the al-Qaeda-breakaway group closer to its dream of carving out a purist Islamic state straddling both Syria and Iraq. 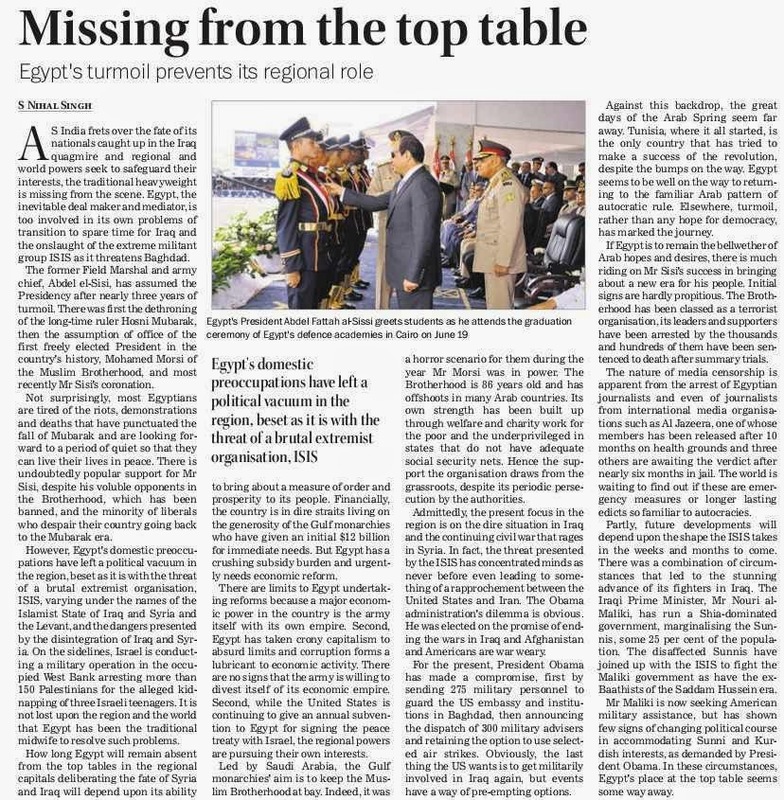 If they succeed in their quest, they could further unsettle the already volatile Middle East and serve as a magnet for Jihadists from across the world - much like al-Qaeda attracted extremists in Taliban-ruled Afghanistan. With Prime Minister Narendra Modi stressing the need for increasing arms exports, the Defence Research and Development Organisation (DRDO) has said India can sell combat aircraft and missiles whose production cost would be “much lower” than some of the weapons sold by countries such as China. 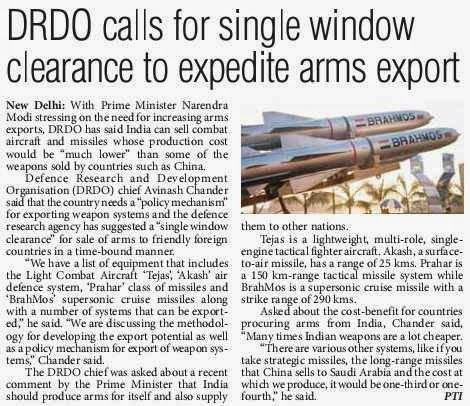 DRDO chief Avinash Chander said the country needs a “policy mechanism” for exporting weapon systems and the defence research agency has suggested a “single window clearance” for sale of arms to friendly foreign countries in a time-bound manner. “We have a list of equipment that includes the Light Combat Aircraft ‘Tejas’, ‘Akash’ air defence system, ‘Prahar’ class of missiles and ‘BrahMos’ supersonic cruise missiles along with a number of systems that can be exported,” he said. “We are discussing the methodology for developing the export potential as well as a policy mechanism for export of weapon systems,” Chander said. The DRDO chief was asked about a recent comment by the Prime Minister that India should produce arms for itself and also supply them to other nations. Tejas is a lightweight, multi-role, single-engine tactical fighter aircraft. Akash, a surface-to-air missile, has a range of 25 km. Prahar is a 150 km-range tactical missile system while BrahMos is a supersonic cruise missile with a strike range of 290 km. On the cost benefit for countries procuring arms from India, Chander said: “Many times Indian weapons are a lot cheaper. There are various other systems, like if you take strategic missiles, the long-range missiles that China sells to Saudi Arabia and the cost at which we produce, it would be one-third or one-fourth,” he said. 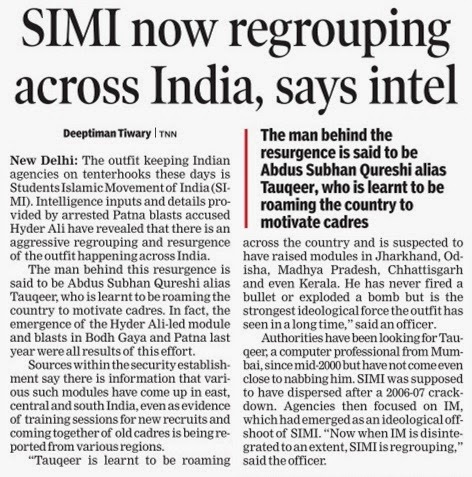 A little over a year after Parliament attack convict Afzal Guru was hanged, Indian security agencies have been alerted about the presence of an 'Afzal Guru squad' in Pakistan Occupied Kashmir (PoK). Guru was hanged on February 10 last year inside Delhi's Tihar Jail for his involvement in the December 2001 Parliament attack. Sources said with not more than 30-40 members, the squad was looking forward to carry out attacks in India. Sources said the two attacks through Hiranagar near Kathua were the handiwork of the group. The latest was in March this year. The first attack through the route was in September last year when terrorists had attacked an Army camp in Samba. 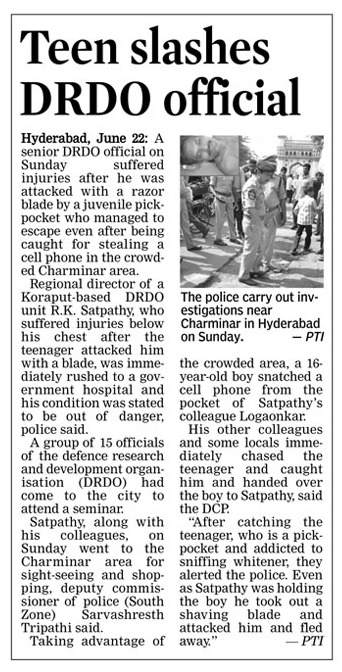 Sources said the group had been directed to do something 'spectacular' in case its members face the Army or the Border Security Force along the Line of Control. Banned Jamaat-ul-Dawaa chief Hafiz Saeed, who is wanted in India for his role in the November 2008 terror attacks in Mumbai, had in February last year reacted to Guru hanging by saying "Guru's death has brought new life and vigour to the freedom movement in Kashmir. It has revitalised the locals to such extent that I am seeing them going towards their destination -- the liberation of Kashmir". Time came to a standstill for 53 officers who passed out of the Indian Military Academy (IMA) in February 1964 when they met each other after almost 50 years on the golden jubilee course reunion held here on Friday. The batch that passed out on February 9, 1964, comprised of 1,192 GCs (Gentlemen Cadets), including 20 GCs of Nigerian Army, 151 from 33rd Regular Course, 52 from 3 OTU (NCC course), 49 from 4 SSRC (technical entry) course and 914 of EC-7 course. 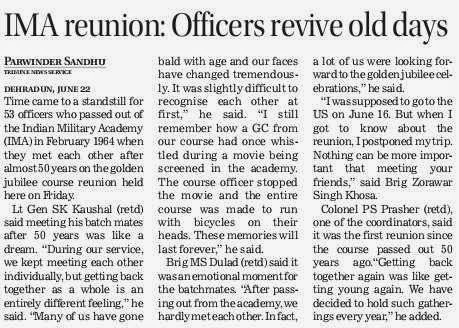 Lt Gen SK Kaushal (retd) said meeting his batch mates after 50 years was like a dream. “During our service, we kept meeting each other individually, but getting back together as a whole is an entirely different feeling,” he said. “Many of us have gone bald with age and our faces have changed tremendously. It was slightly difficult to recognise each other at first. For two days spent at the academy, we were GCs once again. We were pulling each others’ leg, recalling the nicknames, punishments and pranks,” he said. Lt Gen Kaushal recalled, “During those days, even a simplest of act would invite punishment for the entire course. “I still remember how a GC from our course had once whistled during a movie being screened in the academy. The course officer stopped the movie and the entire course was made to run with bicycles on their heads. These memories will last forever,” he said. Brig MS Dulad (retd) said it was an emotional moment for the batch mates. “After passing out from the academy, we hardly met each other. In fact, a lot of us were looking forward to the golden jubilee celebrations,” he said. The importance of the reunion for these officers could be gauged from the fact that while some especially flew down from the US and Australia, few others postponed their foreign trips. “I was supposed to go to the US on June 16. But when I got to know about the reunion, I postponed my trip. Nothing can be more important that meeting your friends,” said Brig Zorawar Singh Khosa. JAMMU: In a major breakthrough, Army busted a militant hideout ton Sunday and seized a war-like cache of arms and explosives, including 60kg of RDX and 104 explosive devices, in Kishtwar district of Jammu & Kashmir. Troops of Rastriya Rifles, on specific information, launched a massive search operation in Keshwan forest belt of Kishtwar district, ministry of defence spokesperson M Mehta said. 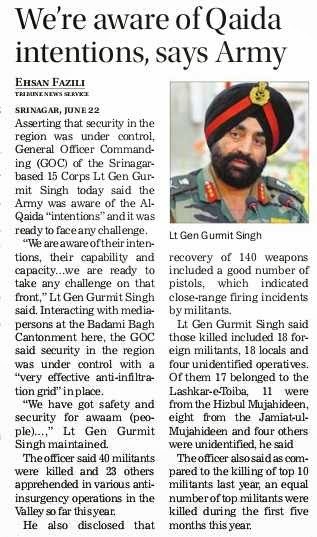 "This is the biggest recovery made by the troops this year in Jammu region and perhaps the largest one in the past few years in Kishtwar," he said. A big haul of arms, ammunition and explosives, including 60kg of RDX, one kg of Russian Marking explosive, 2kg unidentified explosives, one AK series rifle, one plain rifle, three 12-bore rifles, two pistols were recovered from the hideout, he said. Besides this, the troops also recovered 104 explosive devices, including 43 hand grenades, 3 Rocket Projectile Grenades (RPGs), 40 detonators and 19 UBGL grenades, he said. NEW DELHI: The days of AK Antony’s locked approach on social networking have taken a beating retreat. The Defence Ministry, led by Minister Arun Jaitley is preparing to see the days of spectacular #FF and get tweeting. It is giving up on the cautious stance of his predecessor and is preparing to make its presence felt on social networking. Jaitley has given fresh directions to the Defence Ministry’s Directorate of Public Relations to get into the social media sphere. It will now connect to people through Twitter and Facebook. A month into the new NDA government under PM Narendra Modi, the resistance against an open communication policy for the central government departments has been shed. In January, when the UPA was in power at the Centre and Congress leader A K Antony wielded power, he had signalled bureaucrats not to relent to the Information and Broadcasting Ministry push for the Defence Ministry and the Armed Forces to get on to Twitter and Facebook. With PM Narendra Modi being very active on social media, the Defence Ministry is now shifting its stance and is formulating a social media policy. This came after I&B Ministry promised all necessary assistance. Following a latest missive from I&B Ministry, the Ministry of Home Affairs is tweeting under @HMOIndia. 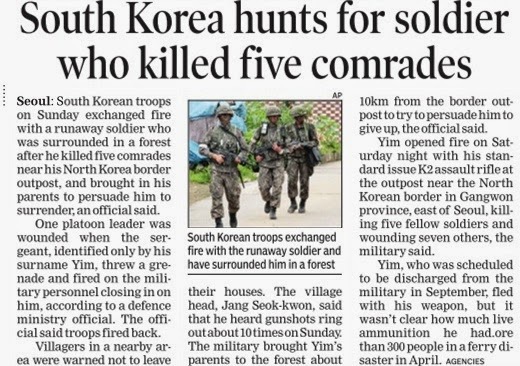 The Defence Ministry is looking to emulate its North Block neighbour. “The PM and the Defence Minister are active on the social media platforms, actively disseminating information about their schedules, visits and meetings with both Indian and international leaders. The Home Minister too has now joined them in the social media. After the PMO and I&B Ministry, the latest to join Twitter is the Ministry of Home Affairs. The Defence Ministry should not be left behind,” said a bureaucrat in the ministry handling these issues. I&B Ministry under Prakash Javadekar is vigorously pursuing the policy of open communication and the idea is catching up with all ministries, Defence included. “The Defence Ministry’s social media presence, despite so many restrictions, is a challenge which we have to overcome. We cannot shy away from a presence on any social media platform,” a Ministry official said. In January, when the matter was first broached, the issues were examined. Antony dismissed the suggestion that had first come from I&B Ministry under then Minister of State Manish Tiwari. Antony was wary of the social media after his council of ministers colleague Shashi Tharoor got into trouble over his tweets. The shift isn't going to be easy. There are several issues involved, such as information flow to keep the Twitter handle or Facebook account active, the means to stay online such as computer or iPads or even mobile phones, manpower to work in this sphere, and changing rules and regulations that now prevent social media presence. “As of now, Joint Secretaries and officers above that rank are allowed to use a smart phone in the Defence Ministry premises. Also, the public relations department is not mandated to be in the social media. So, rules and regulations in this regard need to be amended. Also, the necessary infrastructure and manpower to be active on social media needs to be put in place,” the official said. A detailed policy note is being made to highlight the issues that need to be addressed, particularly, about the flow of information from the top to those handling the social media functions of the Defence Ministry. Interestingly, the Indian Army is not new to social media space. For a year now, the Indian Army has successfully got into the social media space, enjoying 1.73 lakh followers on Twitter and 5.83 lakh 'likes' on its Facebook page. The prime mover of the Army’s presence in the social media is the Additional Directorate General of Public Information (ADGPI), an idea that was followed up by its Pakistani counterpart, the Inter Services Public Relations (ISPR). Both use their eponymous abbreviations for their respective Twitter accounts and Facebook pages. “In the case of the Indian Army’s social media presence, it was a well-thought out experiment. It’s a success. Allocation of resources for the social media hasn't been a problem. The ADGPI has been given the mandate to be on the social media platforms,” a senior Army officer said. But in the case of the Air Force and the Navy, the media relations set up is very small and often stretched to its limits in terms of resources.